TV wall mounts are increasingly becoming more and more common and for good reason. A news article reported that around 200 children have died due to falling TV sets, and there were around 18,000 injuries, in 2011 alone. That is one dead child every three weeks. Most of the time, this was due to parents moving their older TV sets to the bedroom and children playing with them. If the TV sets were mounted, there would have been a lesser chance of those tragic accidents. TV wall mounts are increasingly becoming more important as more and more TV sets are designed to be mounted. TV wall mounts are safer and more durable compared to the classic cathode TV sets placed on a cabinet. TV wall mounts are also immensely more widespread now due to another characteristic; they save quite a lot of space. Another good thing about wall mounts is that they can be placed almost anywhere to enhance the viewing experience. Unlike cathode TV sets which need to be placed on a cabinet or a flat surface, TV mounts allow TV sets to be attached to a surface, provided the studs are big enough. However, not all TV wall mounts are created equal. There are a lot of different TV wall mounts serving a lot of people in their own ways. Since the needs of the customers are varied, TV wall mounts were made to accommodate them. However, we are not comparing apples to oranges; they have differences, but by all means they are just TV wall mounts with an added benefit on one area. Below are the types of TV Wall Mounts that can be found today. Also known as the stationary or the low-profile wall mount, this is the first type of wall mount when TV wall mounts were introduced to the market. These wall mounts are named as fixed wall mounts due to them being fixed in one place. Once they are fixed, it is immensely difficult to adjust them, even downright impossible to do unless you take out the wall mount and install it again. The great thing about this kind of wall mount is that it is very easy to install. They usually arrive fully assembled and this really helps in reducing the time to install, unlike other wall mounts which may need to be assembled part by part. This ready to mount element is also safe; sometimes, people may not follow the instructions carefully, which may make the strength of the TV wall mount be compromised. 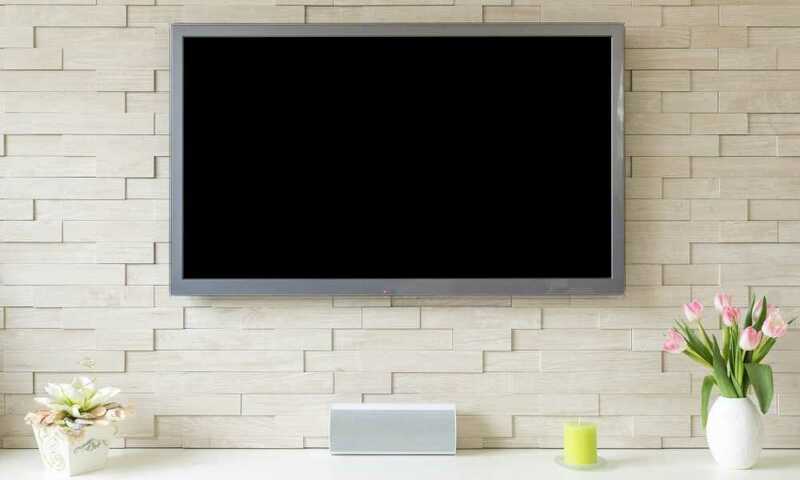 Due to their strength and simplicity, most TV wall mounts carrying from 50 to 75 inches flat screen TV sets will use the fixed TV wall mount design. These mounts are extremely sturdy, arguably sturdier than most other designs. The tradeoff for their sturdiness is their inflexibility. They cannot tilt or swivel. This makes them perfect for room with only one viewing location, like a living room. They are not compatible with flat panel TV sets with a protruded rear, since the nearer they are to a wall, the hotter it will be and this may affect the TV set. The next step from the fixed wall mounts are the tilted wall mounts. Their name is characteristic of their use; think of them as fixed wall mounts than can move slightly up or down. This tilting mechanism is done with a pivot that can be found inside, specifically the middle part of the installation bracket. The tilting factor was added due to mainly two different yet related reasons. These are the occurrences of a glare that hurts the viewer’s eyes and also the market’s preference for flexibility. A TV glare occurs due to a source of light with its light bouncing off the surface of a TV screen. This may be caused by a light bulb or the peeking sun. To remedy this, you can move the screen so that the glare will be lesser or even removed. Another great improvement the tilt wall mount has is that the TV set is now capable of being viewed from more than one angle. Due to the wall mount being flexible enough, one can attach this to a pillar and then just tilt it if the glare from the sun is too much, making it perfect for an open-air room. The latest move is the swivel wall mount. These wall mounts can swivel left and right, giving them great mobility. In fact, most swivel wall mounts are also tilt wall mounts. This allows them to almost rotate in a way. This immense mobility is great for people looking to have multiple viewing perspectives. You can imagine a sports bar or a hotel using these kinds of wall mounts. Most of them do need some assembly to properly connect them. Knowing is half the battle; each type of wall mount has its own strengths and weaknesses. If you only have one location with one viewing perspective, the fixed wall mount will do fine. If you are in a room with too much glare, a tilt has the best value while if you are expecting a large amount of people, the swivel wall mount will work fine.